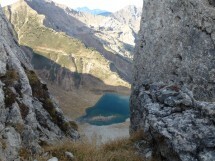 On Sunday, August 14, I organize a circular hike to Pointe D’Entre Les Deux Pertuis (2176 m). We start from Lac De Montriond. Walk on the ridges between three lakes (Montriond, Tavaneuse, Plagnes). More than 2/3 of the route is completely wild. Extraordinary view. … Some parts of the ridges are vertiginous. Gradient gain: 1145 m. Length: About 11 KM. For very experimented and sporty hikers. Maximum 12 people, not having vertigo. We meet at Gaillard, behind the customs of Moellesullaz, in front of the Librairie de France at 7 :30. Inscription is obligatory.